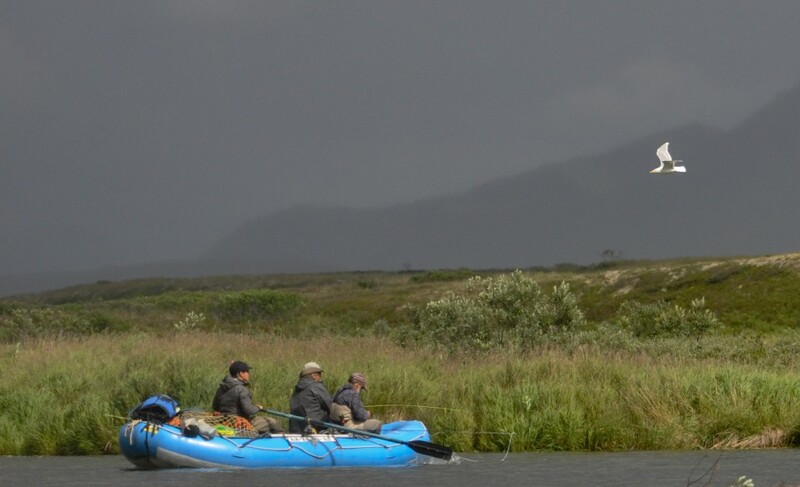 Bristol Bay Fog and showers slowly lifted as our scheduled “fly-out” day wore on and our pilots struggled to find openings in the weather to fly out of Dillingham to Goodnews Lake. 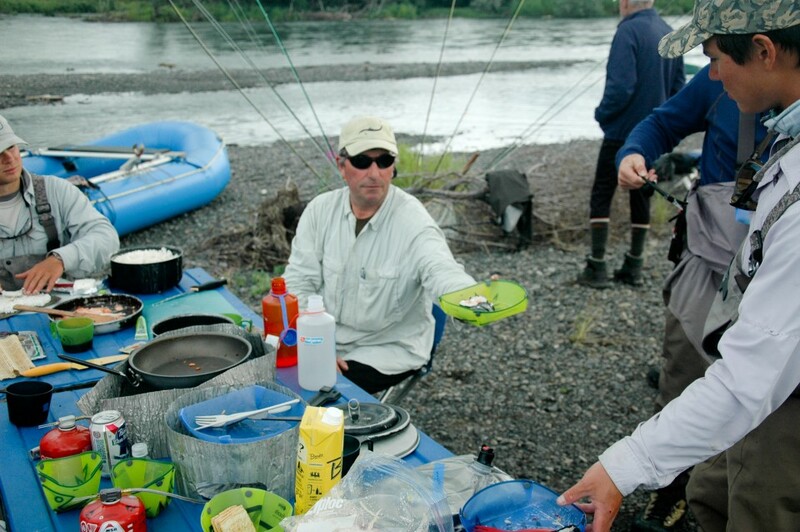 By early evening we had the rafts loaded and we pushed off through the mist down the North Fork of the Goodnews in the Togiak Wildlife Refuge Wilderness. 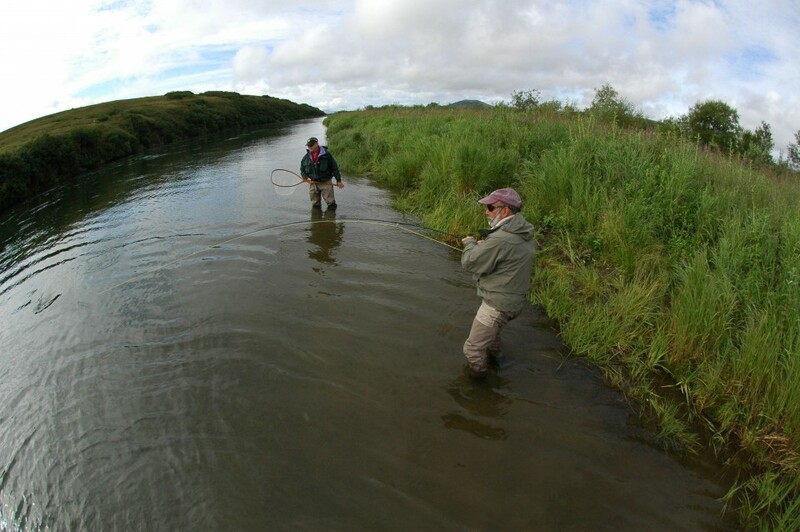 Water levels across Bristol Bay were high after a week of rain but we’d chosen this particular river because it was the farthest removed from the track of the prior storms. Still there are no water level gauges in the wilderness and at some point, after due diligence one shoves off into the unknown. 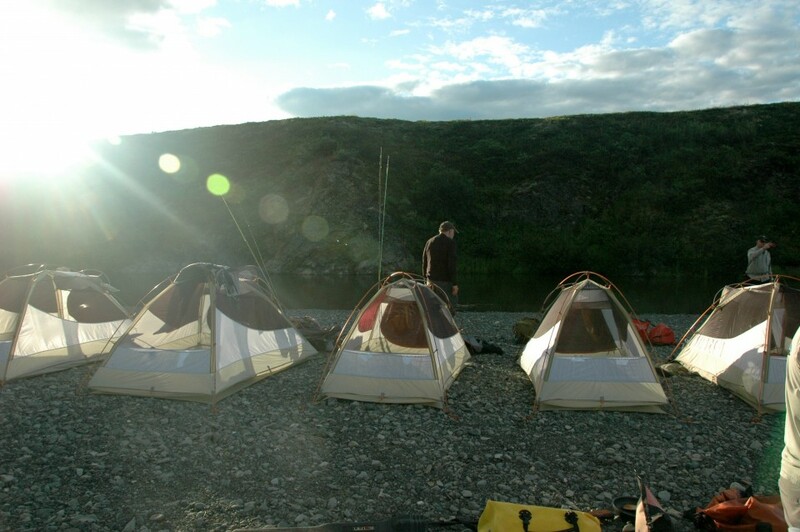 We travelled past a lone brown bear fishing between small islands then made camp on a long gravel bar, pitching our tents. Finally there was time to fish. 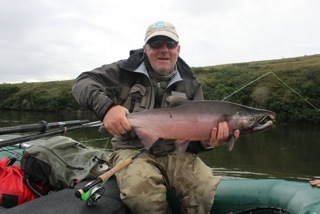 Dave Linse took the first fish of the trip, a lovely Dolly Varden Char with bright pink spots on a green back with silver flanks. More were caught and released, several dozen more according to the log, and a few retained for our midnight dinner of pasta, a red sauce with Char, and salad. It was a great thing to finally be on the river. Indeed most of us had planned the trip for a year or more and the realization of the dream was palpable. We slept as rain showered the mist shrouded alpine peaks around us. 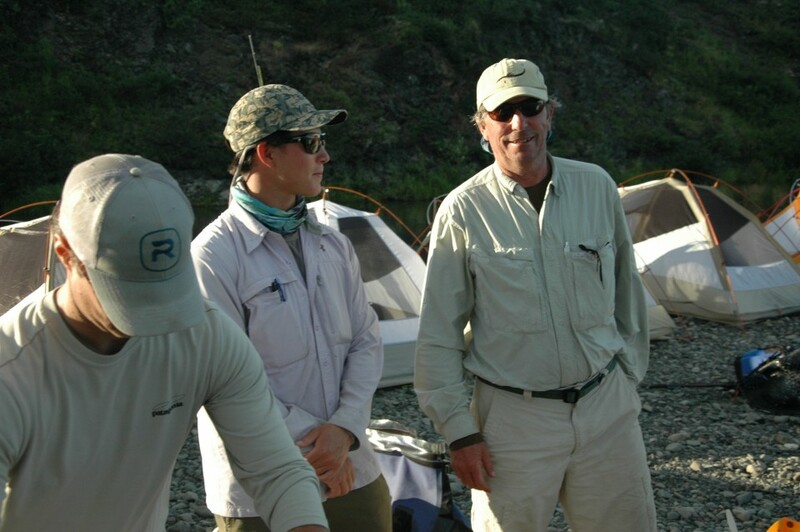 Our group of wilderness anglers came together from New England, the Midwest, the Rockies, and the Pacific Northwest. 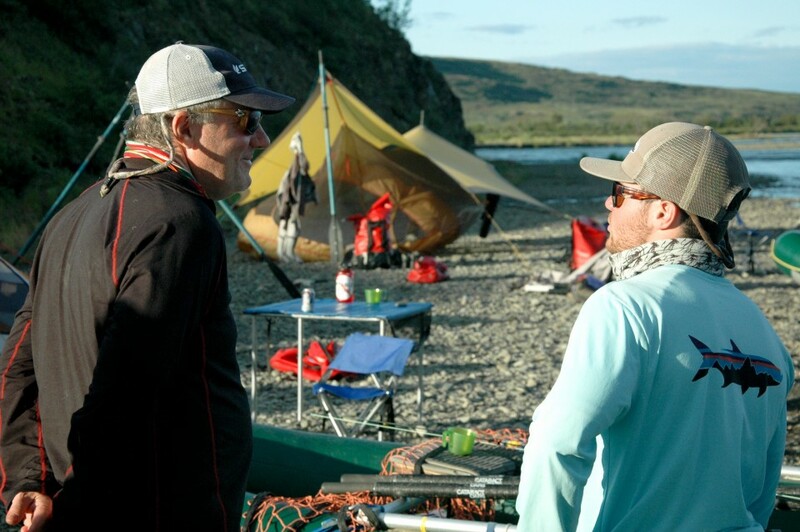 All were passionate fly-casters drawn toward the peak of the Bristol Bay Salmon, Dolly Varden Char, and Rainbow season. Would the river hold up to it’s legendary reputation? Dave and Bob Erickson and I floated and fished through amazing numbers of Char and a handful of Coho Salmon were taken. 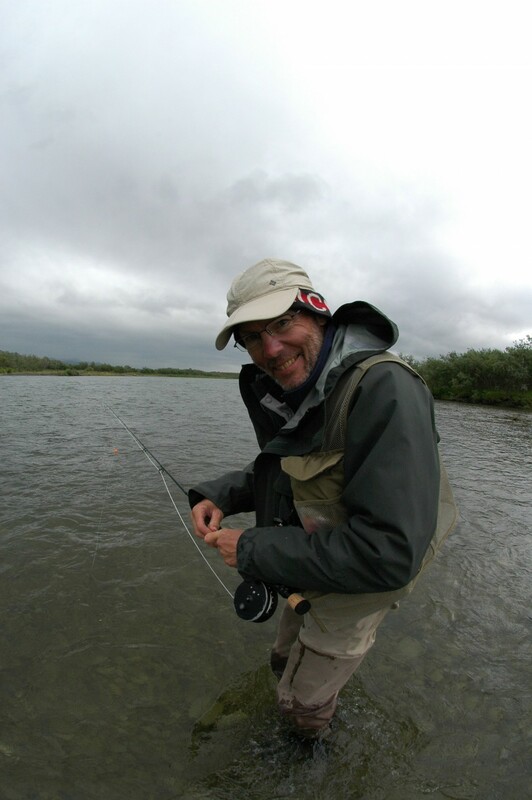 Bob took a large Char below a bluff on a bend in the river favored by the other anglers who we shared the river with, Brown Bear. As the morning passed Alex & John Jinishian, and Alex Orb mastered the techniques for Char while Bill Latshaw, Michael Curci & John Moore already were in their element. 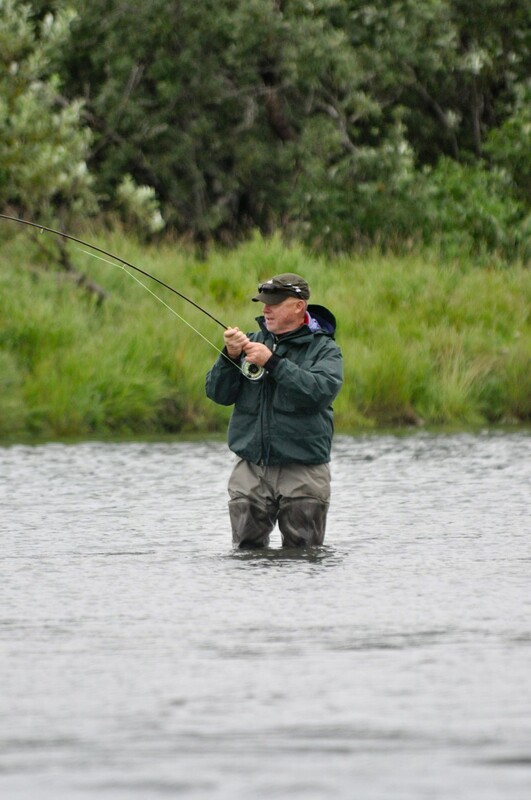 While the fishery was very strong, the river continued to rise and the heavens poured rain all day. Then at camp that second evening an opening was ripped through the storm clouds and the weather broke, turning fair. What a relief! As we travelled and fished through the minor canyons of the upper river we had chances to swing streamers taking both Char and Coho / Silver salmon and the streamers incidentally took some very nice Arctic Grayling as well. 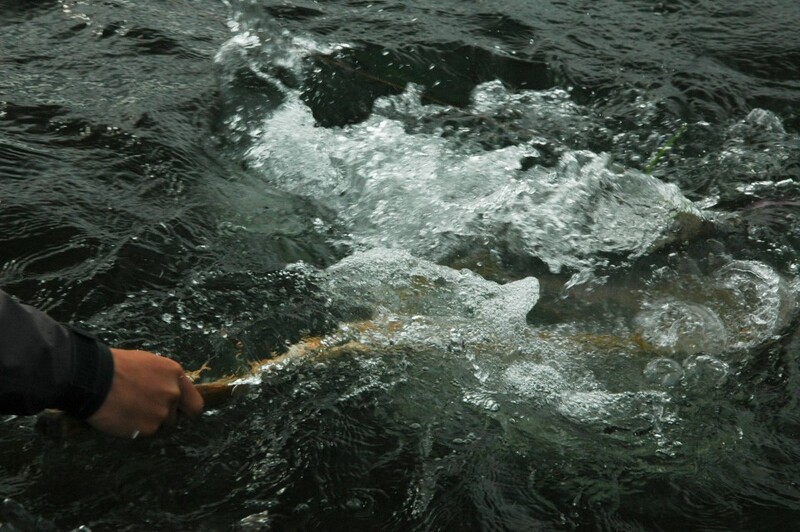 The Dolly Varden’s arrival, calendar timed by genetic code were here to feed on Chum and Sockeye spawn. We found the Chum spawn to be nearly completed, the majority of spawners had all been washed downriver and their carcasses turned into biomass. Sockeye however were spawning and with a bit of experimentation the anglers matched their spawn with trout beads. The fishing was very, very strong. Considering the weather we had to work with: In the past 4 decades working in and adapting to Alaskan weather and I’ve experienced times when the outcome of a wilderness trip is up to the weather, or volcano, wildfire, earthquake, glacier and other overwhelming forces of nature. We’d heard of parties in the last week that’d been flooded out of river camps and cut short or evacuated their trips. In cases where the environment becomes extreme one focuses solely on safety. How would our week play out floating down a river in stormy weather more typical of late autumn? This week on the Goodnews we were granted “a pass” and the water, remained clear enough to fish, and then began to fall rapidly. The way it works for Pacific Salmon is that schools of fish flood into the river on high rising water in stormy conditions and migrate upstream whereas without rain they hold in the brackish estuary awaiting a freshet. 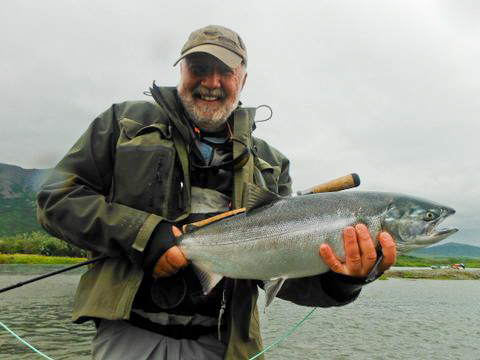 Our group was in the right place at the right time and our anglers had the right skill sets! From the log of Day 4, August 12, 2013. “Sandhill Cranes yodeled in the thick fog at dawn and then continued calling and trading back and forth across the valley all morning. I noted in the log that Bob Erickson had been up since 5:00 am fishing and that he crawled back in his sleeping bag to warm up while I made coffee. He’d caught 2 Coho and various Dolly Varden Char on his signature hand tied variant of a Kilowatt streamer. Today was a spectacular day of Char fishing. I fished with Michael Curci and Bill Latshaw and yet with all the abundance the river had still not peaked in terms of numbers of fish. The blueberries were ripe now on the tundra above the river and family groups of birds, in particular Golden Crowned Sparrows anxiously moved about the river corridor, feeding prior to migration. One could feel the imminent changing of the season to autumn. As we drank our coffee we watched a flock of Willow Ptarmigan fly across the river, and we talked about the day ahead. So far we’d travelled about 30 miles taking us into the heart of the Goodnews fishery. John Moore and Bob and I spent the day in a frenzy of Coho and Char action. We found plenty of both species in non-traditional holding water. 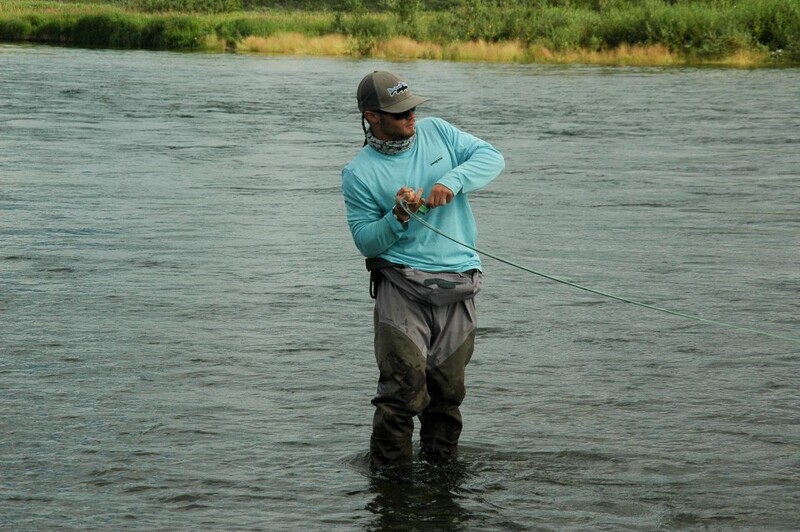 There were periods of sight casting to trophy Char when Coho stole the fly and other times when Char took the Silver Salmon fly. 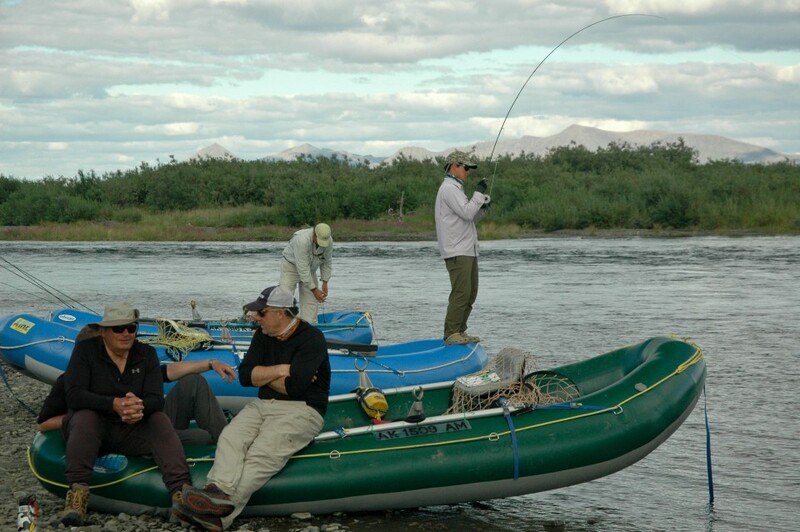 We hauled over to sight fish for an hour in a vast “Char bed”. One could be quite specific about which fish was targeted with the cast. Casting streamers or egg patterns to a large Char bed, which is a concentration of Sea Run Dollies spread out across a gravel bar raises the question “will they take a mouse?” Actually they generally won’t although the often lunge at orange strike indicators. In my experience it is so rare to take one on a mouse as to be a non-productive pursuit. But will they take other dry flies? Or could mouse patterns be modified for Char? The answer to that is a qualified: “Yes.” When one finds Char assembled in large enough numbers it can be worth taking up the challenge. John Jinishian did. 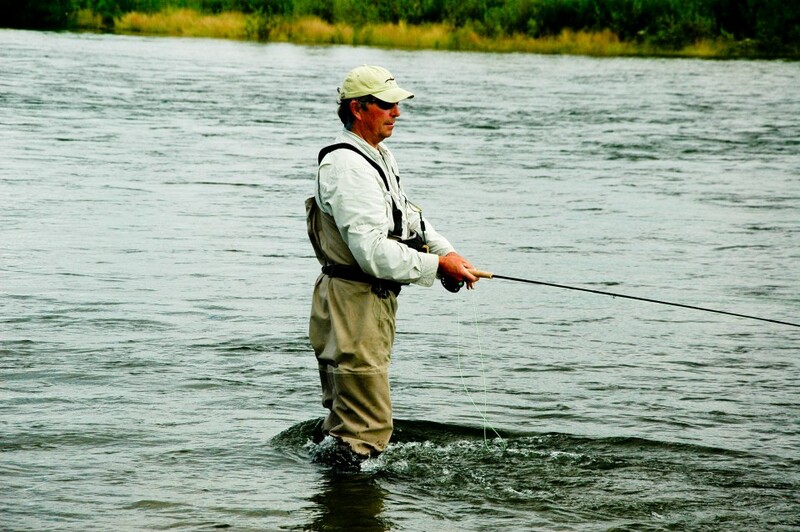 He drifted and then “skated” various dry flies over the Char. Skating or “waking” a fly, was an attraction that proved useful. 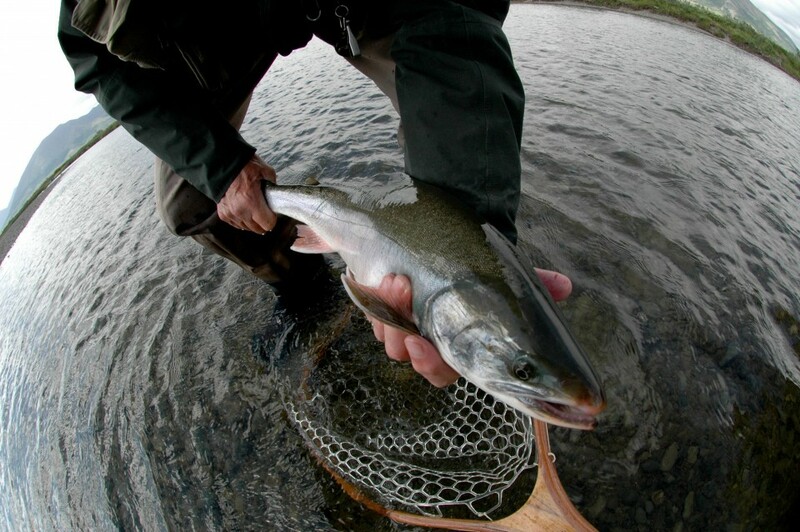 But Char returning to the Bristol Bay Rivers for Sockeye spawn seem to focus solely on orange hued salmon eggs. 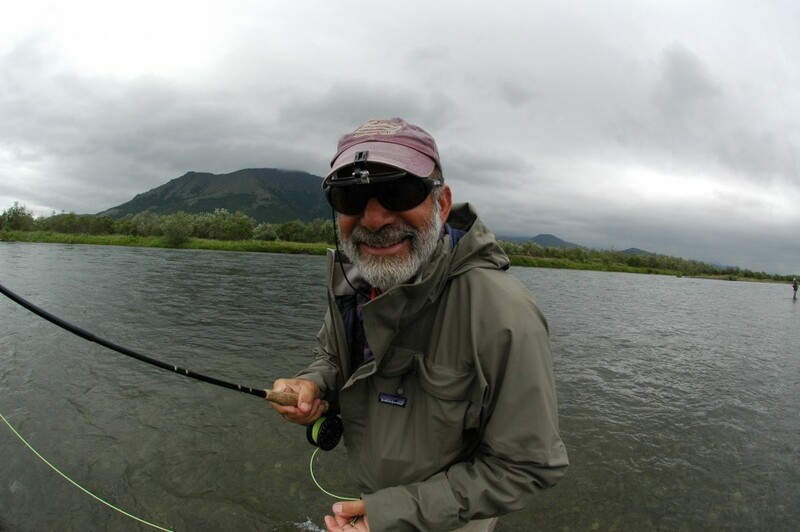 John worked through Chernobyl Ants, caddis, and other patterns before hitting on orange tufted Stimulators. 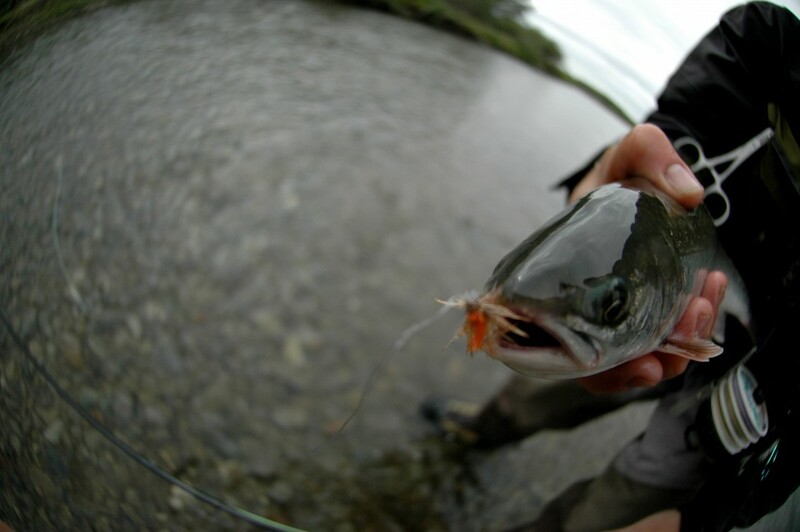 Perhaps experimental orange salmon egg color “waking” flies have a place in your fly box. The sockeye spawn we were witnessing was such a magnificent and primeval episode. The fish themselves were both beautiful and grotesque. 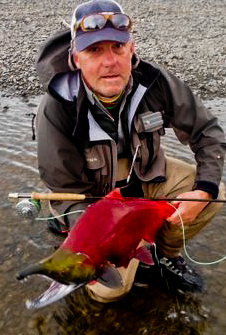 The scarlet hue of the Sockeye flank is unlike any other salmon, and hence their nickname “reds” while their head is contrasted an olivacious green color. The males metamorphose into an extravagant hook jawed creature, a relic of the last ice age, a Pleistocene memory. They are indeed as ecologist’s say, a “keystone” species upon which the ecosystem’s health balances. 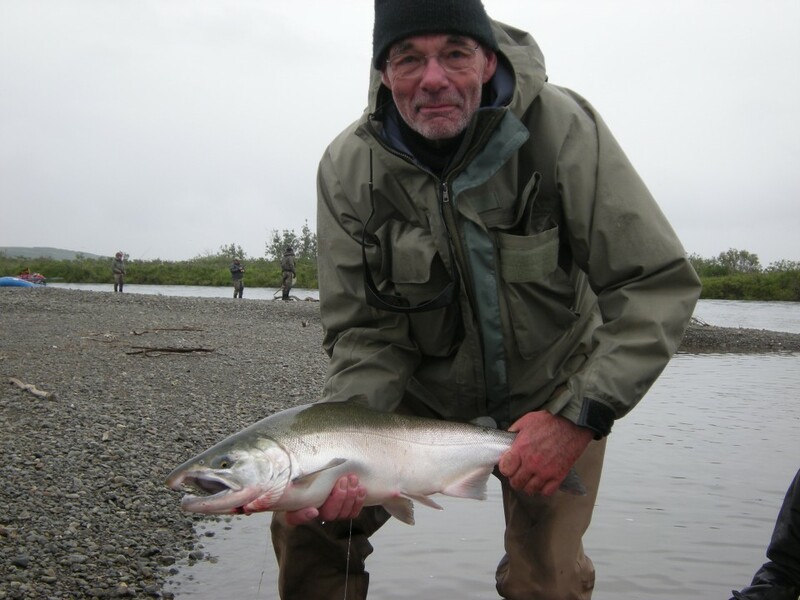 The bears, char, gulls, and salmon fry all depend upon the post spawn salmon carcasses. The birdlife in the upper river was Arctic Terns and Tree Swallows, Greater Yellowlegs, and Least Sandpipers but in the lower river we were passing through the primary salmon-spawning habitat. 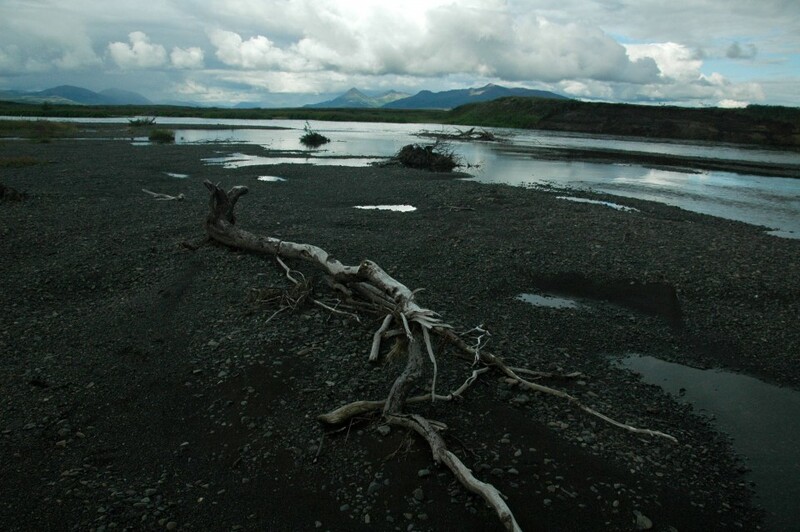 Carcasses of spawned out fish became common on sand bars. Now the river’s “Sanitary Engineers” dominated the scene, Glaucous-winged Gulls, Bald Eagles, and Ravens. The Glaucous-winged Gulls need a big food source and will only be found where large numbers of salmon are in residence. 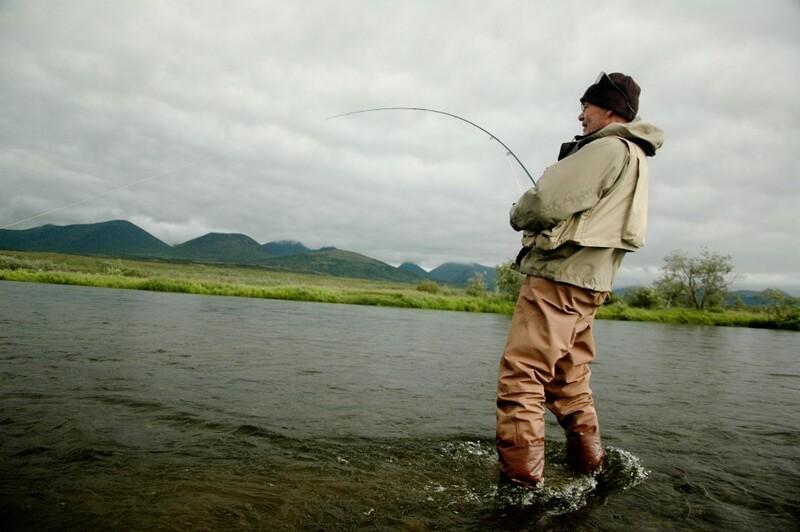 Their appearance indicated the richness of the salmon fishery. 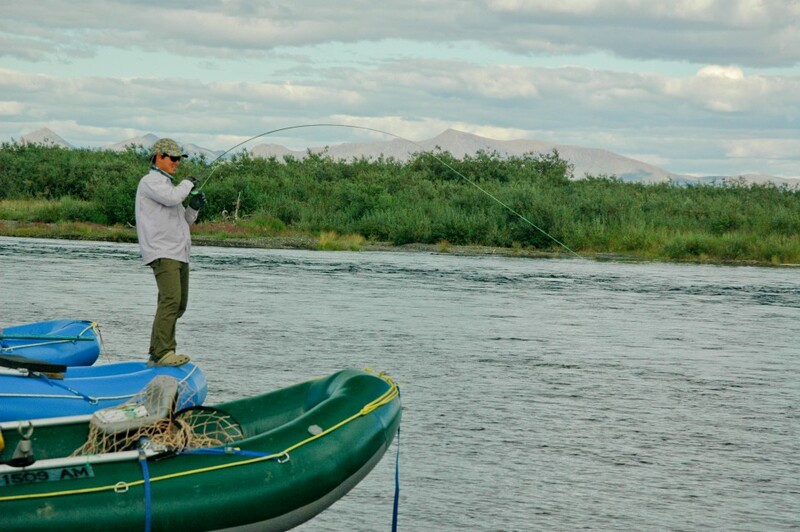 We rafted down river pulling into the side channels where the Sockeye and Chum spawn was attended by Rainbow Trout and Dolly Varden. 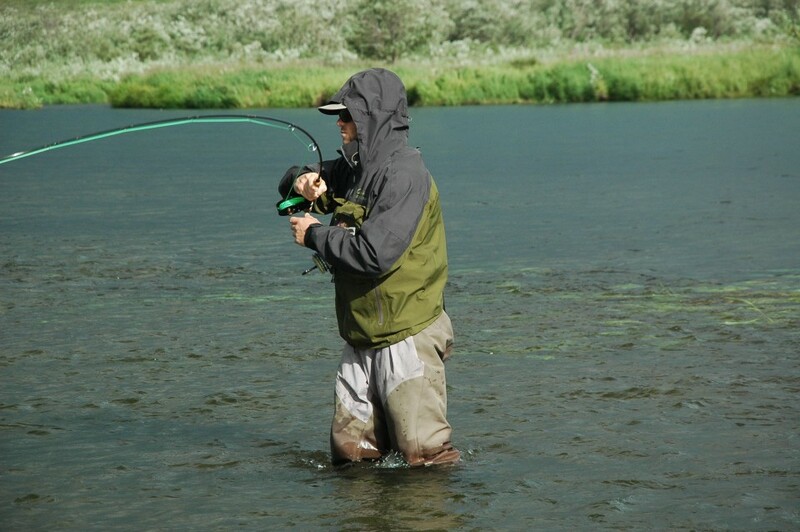 We passed the mid point of the trip and our shoulders and elbows complained about the long days of casting. Still one felt compelled. We’d come all this way. There was a channel on “river right” where Coho were stacked in good numbers and we spent some hours there. 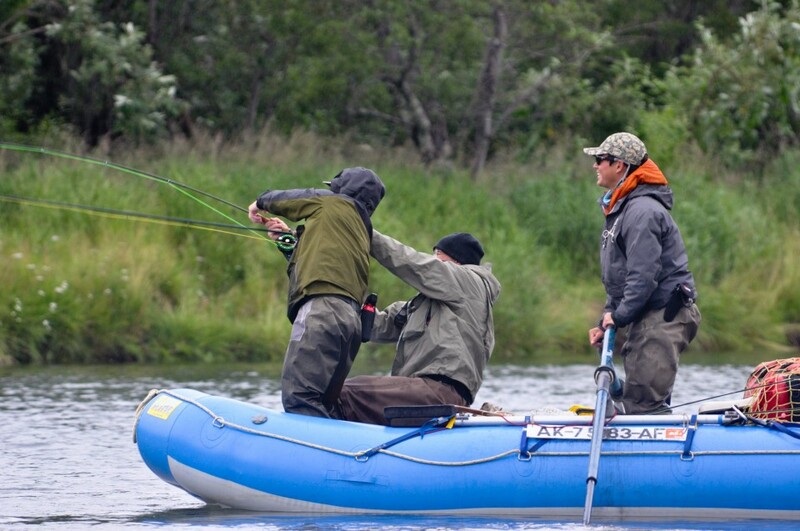 It is both the wonderment and the curse of raft-based fly-fishing that one must eventually “push off” down river. We can’t power up the outboard motor and return upstream to yesterday’s fishery and so we head downriver inspired to learn something new. The Coho fishery of the mid river was so strong that we hated to move beyond it but there was the promise of great things ahead on the lower Goodnews. The lower river is ecologically complex, with side channels and “braids’ creating vast amounts of fish habitat across the wide lowland valley. Wolf, Red Fox, Mink, and Brown Bear tracks covered the sand bars. White Fronted Geese, Sandhill Cranes, and Red Throated Loons winged across as we went about our camp activities. 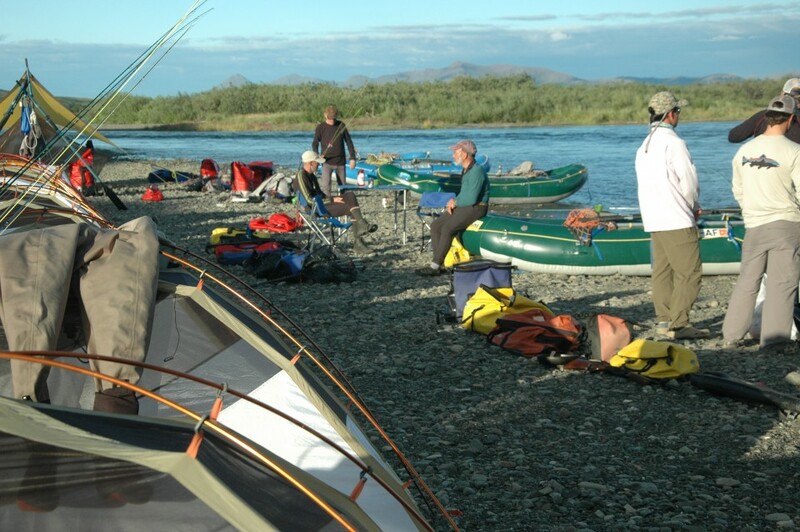 Accustomed to the procedure of making camp in the evening and breaking camp after breakfast we moved steadily along. Perhaps it mattered a little less by this point how the fishing would unfold, because we’d exceeded our expectations already. The anglers talked about falling water levels and that perhaps the best was yet to come, but who would believe that? There are a handful of bluffs but mainly the lower Goodnews spreads across the landscape like an unraveled rope. Sinuous, it curved back on itself in big loops full of side channels and gravel bars arranged by prior floods. The land flattened out like the state of Kansas, with headwater mountains receding. This lower portion of the Goodnews River can be somewhat harder to read for an angler accustomed to traditional trout water. 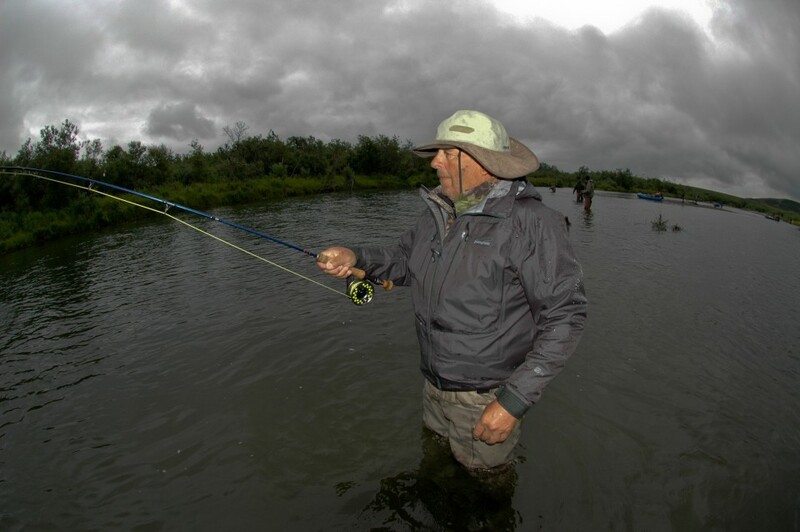 We fished the final miles of classic Pacific Salmon water with fish holding in sloughs and long deep pools. 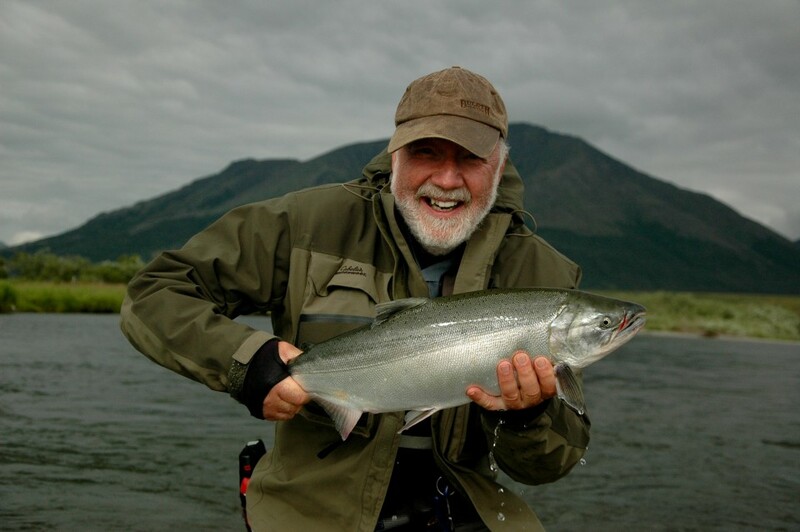 At one time thousands of rivers like the Goodnews, full of Salmon, Char, and Trout stretched from San Francisco to Nome. These days we must travel north to the Togiak Refuge to find the last ecologically intact watersheds.